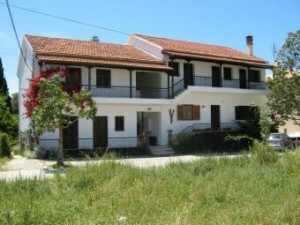 Zambeta Apartments, Arillas, Corfu – Relax, swim, walk, meditate, forget your worries! Since 1985 Han has been welcoming guests to Zambeta Apartments in Arillas, Corfu – a great place to enjoy the sun and sea; to relax and marvel at the beautiful sunset; to savour the best of Corfiot cuisine accompanied by a glass of local wine and traditional Greek music. 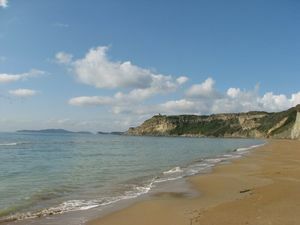 In fact, a perfect place with lovely accommodation where you can unwind and discover the real Corfu. You can also enjoy walking in beautiful surroundings; take a drive through breathtaking scenery; or visit Corfu Town, the historic and picturesque capital of the island. Or you can meditate or enjoy a private session by one of the many session givers around Arillas. 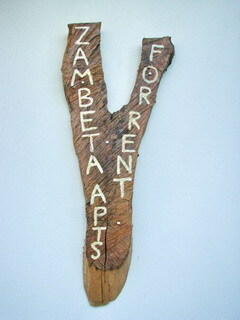 Zambeta Apartments are situated just 200 metres from the beach, on a quiet village road in Arillas. Arillas is one of the bays on the north-west coast of Corfu and retains its authenticity despite some low key tourist development. The long sandy beach is embraced by green hills reaching down to the inviting crystal clear blue sea. The sea-front is lined with family restaurants catering for all tastes. The businesses in Arillas are owned by people who care about their guests and there are no big hotels – just small, family-run self catering apartment complexes. We offer spacious double and triple apartments. All of them come with their own bathroom, balcony, fully equipped kitchen and environmentally friendly mosquito nets. There is no TV and no A/C, as our guests value peace and quiet above all else! The balconies overlook a small but luscious flower and vegetable garden and the olive groves behind it which stretch towards the sea. We speak English, Dutch, German, Greek and a little Italian and are open from April to October. We believe that once you have experienced our unique hospitality you will want to return year after year to Corfu and to Zambeta Apartments, as so many of our guests have done before.